With this module you can perform a capacity test in 3,4,6 lanes with the following methods: Brilon Bondzio, Brilon Wu, Setra and Bovy. Input is by source/destination matrix or through the matrix of percentage of traffic and the vector of the incoming flows with graphical guidance. 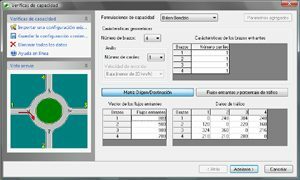 You can also calculate the incoming flows, the capacity and capacity reserve, the saturation ratio, simple and total capacity. With Strato® we guarantee you the highest precision and safety, to design a perfect roundabout!